Because of how close salmon boats stay to river mouths and ocean shores, the industry is safer than many of the other fisheries and is quite easy to break into especially as a processor. For harvesting there are four methods for catching salmon that are broken up into by boats that catch specific types of fish. They are: trolling, drift gillnetting, set gillnetting and purse seining. Your job type and responsibility will almost exclusively depend on the type of boat you work on. The salmon harvesting takes place almost entirely in the summer and thus, is the best time to work the season. The first harvesting takes place in early May within Southeast Alaska followed by the big runs out of Cordova, which begins in mid-May. 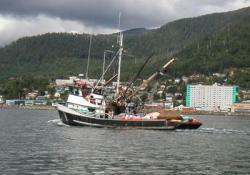 The harvest tends to move with the migrating fish essentially moving through different parts of Alaska. For a better look at the times of year and locations of the salmon fishery see our Fishing Seasons Calendar. Additionally, for a look at job strategies for the salmon fishing industry, check out our Fishing Job Strategies Section for helpful hints and tips for procuring employment.